RCT offers options on how you can ride depending on your needs. Have several places to go? RCT Day Passes allow the freedom to ride as many times as needed on the same day the pass is purchased, for one flat rate. *See chart for pricing details. Please have exact fare ready when boarding an RCT bus. Drivers do not give change. Passengers will not be permitted to ride on a “pay later” basis. Always hand tickets, transfers, or coupons to the driver. Do not put them in the farebox. A monthly pass may be used only by the person who purchased the pass. Monthly passes must be shown upon each boarding. Please Note: No passes available until the 25th of the month before the month that the pass is used for. Should you have to use more than one bus to reach your destination, ask the driver for a free transfer when you pay your fare. Transfers will not be issued at any other time. Transfers cannot be used for a return trip on the route from which it was issued. Transfers are good only at the Stanton Transit Center. Always hand your transfer to the driver; never place it in the farebox. Buses are equipped with two-way radios for improved transfer connections. Using a bus pass or a transfer to “ride around” without a destination point on that route will not be permitted. Monthly passes are available from 9:00 am - 2:00 pm at the Stanton Transit Center from the 25th of the preceding month, through the 5th of the month of issue. 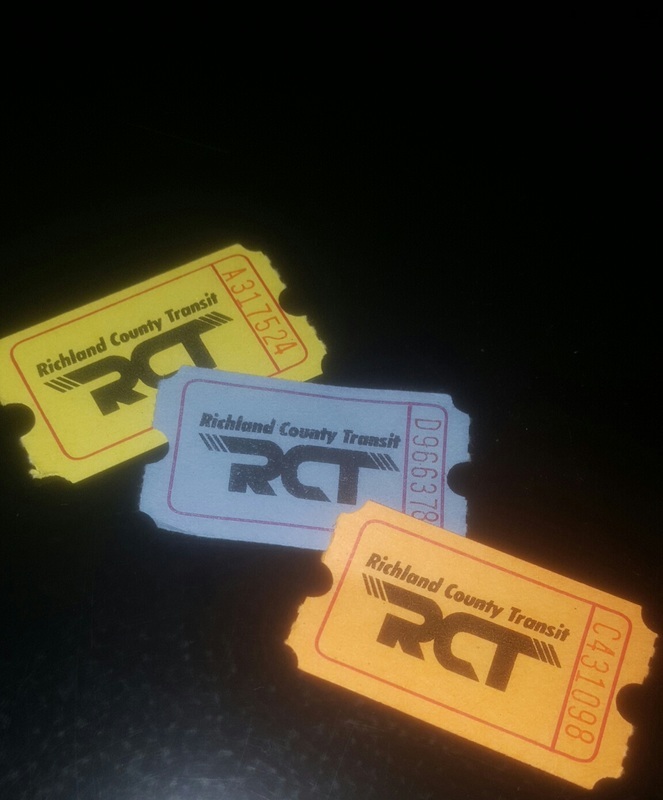 They can then be picked up or purchased at Richland County Transit (HQ) located on 232 N Main St.